Slide Rule - an almost forgotten type of calculator, though it was widely used for many decades. I believe this example is from around 1940 and gives 3 or 4 digit accuracy on multiplication and division, square roots, etc. Knowing how to use a slide rule is a skill which is rapidly being lost. It works on the same principle as Logarithm tables - another skill which will soon be forgotten. 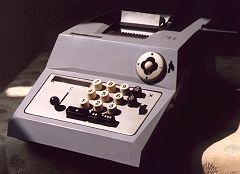 Olivetti Summa Prima 20 mechanical adding machine. Made in Italy, around 1960, based on similar machines from the 50s. The keyboard includes special keys for "10" and "11", for working in pounds, shillings and old pence. Prints the answers on to a small roll of paper using black ink for addition and red ink for subtraction. Works, though it needs a new ink ribbon. Sinclair Cambridge Calculator. This was launched as a build-it-yourself kit for less than £30 in 1973, making it one of the first affordable pocket calculators in the world. It is a very compact four function calculator - just 11 x 5 centimetres (4.5 x 2 inches). About half the space is taken up by four AAA type batteries. The display uses tiny seven-segment red LEDs. Assembly required a fair amount of skill - two ICs and about 20 passive components had to be soldered into a pretty small space! This picture shows the external cassette tape drive at the right. The disk drives cannot be seen. Apricot PC with twin 3.5 inch floppy disks, running MS-DOS 2.0 (1983). This excellent machine was years ahead of its time. As well as the high-resolution monochrome monitor, the keyboard includes a liquid-crystal "Microscreen" to provide programmable labels for the six function keys, and it also worked as a stand-alone calculator. Fitted with 256K RAM, the Apricot was supplied with Microsoft interpreted BASIC and SuperCalc spreadsheet on floppies, along with numerous utilities including a font editor for creating your own screen fonts. Other software available included Pascal, Fortran and Cobol compilers. Apricot Computers - based in the UK - adopted the compact and robust 3.5 inch floppy disk several years before IBM. Hewlett-Packard 150 with Touch Screen and twin 3.5 inch floppy disks, running customised MS-DOS 2.0 (c.1984). HP included a special front-end program for MS-DOS to make use of the Touch-screen for file management etc. The touch-screen uses an array of infra-red light beams across the surface of the screen. Unlike most PCs, the 8086-based motherboard is inside the monitor, and only the disk drives are in the base unit. These are connected using an HPIB cable, also known as GPIB or IEEE-488. There is also a recess in the top of the monitor where a small dot-matrix printer can be installed. Apricot F1 with 10 MB hard disk & colour monitor, running MS-DOS 2.11 (1985). Both keyboard and trackerball-style mouse are wireless, using infra-red links to the system unit - another Apricot innovation which was years ahead of the competition. The system unit was exceptionally small for its time - about the size and shape of a shoe box - but it still managed to hold a hard disk drive and an expansion slot for a modem or other card. As well as MS-DOS and Microsoft BASIC, this also shipped with GEM Desktop - an early attempt at a mouse-driven graphical user interface that pre-dates Microsoft Windows. The 7040 Central processor had floating-point hardware, 3 index registers and a complex instruction set with more than 100 instructions, including hardware multiply and divide. The instruction set was compatible with the faster 7090 system, which NASA used to control the early space missions. Some features of the Fortran language, which is still being used in scientific applications, relate directly to the instruction set of the 7000 series CPUs. This is part of the CPU control panel, showing the power controls, and some of the lights which indicate the contents of CPU registers. One of the logic cards from the CPU. The complete processor contained hundreds of circuit boards like this, plugged into racks the size of wardrobes. The circuits are built from discrete transistors, resistors, diodes and capacitors, and used a variety of supply voltages, both negative and positive. ICL 1900 Mainframe - Memory Card. This was built in 1977, and uses over 130 ICs to make 12K of RAM. The circuit board is about the size of a modern PC motherboard. It is probably organised as 4K x 24, as the ICL 1900 series of British computers used 6-bit characters and 24-bit words. A complete system would include several such cards. The Machine Room at Edinburgh has details of over 1000 old computers. The Trailing Edge is a comprehensive source for "retro-computing". Old Computer Museum - more than 500 models. The Virtual Museum of Computing has dozens of interesting links. Paul Pierce's Computer Collection in the USA includes several early IBM mainframes. Stefan's Computers total more than 100 and include some interesting items. Fee Computer Services has a collection of mainframes that includes an IBM 7040 control panel. Collection of mechanical adding machines - in Italian. ACT Apricot collectors for Apricot specialists. For a summary of the history of computing, try this Timeline. The 'What Is' site explains computer & internet jargon. Computer Emergency Response Team (CERT) has reliable news and unbiased advice about computer security, viruses, etc. Electronic Frontier Foundation (EFF) campaigns to preserve the privacy and freedom of Internet users. Politech is Declan McCullagh's frequently updated site covering developments in Internet legislation, copyright, and similar issues (US based). Photographs © Copyright by Weben, 1998-2006.